PRIEST LAKE, Idaho – Four years ago, Mike and Chantell Sackett cleared a lot to build a house overlooking one of North Idaho’s most scenic mountain lakes. They pictured a roomy A-frame, with a deck for entertaining. At the front of the house, windows would frame views of Priest Lake and the deep forest stretching down to the lake’s indigo water. From the back, the couple could watch the Selkirk Mountains change with the seasons. But instead of their dream home, the Sacketts got a bitter legal fight with the U.S. Environmental Protection Agency about whether they improperly filled in wetlands on their lot. Now, the fight is headed to the U.S. Supreme Court, which is expected to hear the case in January. Sackett v. EPA has turned into a high-stakes legal battle over how and when landowners can challenge wetlands designations on their property. Wetlands are important ecologically, providing natural water filtration and rich habitat for critters as varied as muskrats, marsh wrens and salamanders. The federal government regulates private wetlands through Section 404 of the Clean Water Act – a long-standing point of contention for advocates of limited government. The Sacketts’ case has garnered national attention “because it’s a case that could happen to you,” said Damien Schiff, a senior attorney for the Pacific Legal Foundation, which is representing the Sacketts pro bono. The Sacramento-based legal nonprofit focuses on property rights cases. “The Sacketts are not big developers. They just wanted a family home,” Schiff said. The Sacketts have appeared several times on Fox News. They’ve also told their story to the New York Times, and testified at a congressional hearing on property rights convened by Sen. Rand Paul, R-Ky., in a marble-paneled room at the nation’s Capitol. Putting their lives on display hasn’t been easy for Chantell Sackett, who said she’s more private than her outgoing husband. However, “We’ve always done the right thing. We feel that this is the right thing to fight for,” she said. While the political and legal questions play out, the couple’s dream home remains on hold. The site is covered with gravel piles and scruffy vegetation and the Sacketts are living in a rental. Nothing has happened since the EPA shut down the project in 2007. Mike Sackett, 45, grew up in Spokane, but has lived most of his adult life at Priest Lake. He’s an avid fisherman and snowmobiler. Chantell, 42, who moved to the area later, was taken with Priest Lake’s natural beauty. In 2005, a friend sold the couple a lot on Kalispell Bay Road for $23,000. Chantell Sackett said the 0.63-acre lot offered the opportunity to move closer to the water, without the steep taxes associated with lakefront property. Though other houses had been built between their lot and the water, an easement offered direct access to the lake. The Sacketts drew up their house plans and got a building permit from Bonner County. They cleared brush and started hauling gravel to the site. Three days later, two EPA officials and a U.S. Army Corps of Engineers employee showed up. The Sacketts said they hadn’t realized that their property might be subject to the federal Clean Water Act, and that placing fill on the site would require a 404 permit. EPA officials have declined to comment on the case. However, in a letter to the Sacketts, EPA officials said their lot contained palustrine wetlands, a type of freshwater wetland characterized by woody shrubs and small trees. Directly across the road from the Sacketts’ property, there are fields with pools of water, alder groves and beaver dams. A fringe of cattails borders part of the couple’s churned-up lot. But Mike Sackett said he hired a soil scientist, hydrologist and wetlands expert, whose studies dispute that the lot contains wetlands. The couple contend that road construction altered the area’s hydrology, cutting off the flow of water to their property. EPA officials had other ideas. They wanted the Sacketts to remove the gravel fill, replant the property with wetlands species and monitor the site for three years. The Sacketts were told that they could apply for a 404 permit through the Army Corps of Engineers after the site was fully restored. If a permit was granted, the couple could then fill in the site and build their house. But the Sacketts aren’t interested in restoring the property or applying for a permit. “It isn’t wetlands,” Mike Sackett insists. Seven months after the visit, the EPA issued a compliance order, telling the couple to restore the property or risk fines of up to $32,500 per day. “That’s a pretty startling letter for most people to get,” said Holly Doremus, an environmental law professor at the University of California, Berkeley. The Sacketts said the compliance order backed them into a corner. They could wait for the EPA to enforce its order through U.S. District Court in Idaho, but that scenario carried the risk of amassing potentially millions of dollars in fines if they lost. The Sacketts wanted their own day in court, to argue that their lot wasn’t a wetland. “That’s all they are asking for here, the opportunity to go to court and deliberate about this question: Is this a jurisdictional wetland?” said Reed Hopper, the Pacific Legal Foundation’s principal attorney. The case, at its heart, is really about judicial due process, said UC Berkeley’s Doremus. But the wetlands piece, she said, is critical in the broader legal and political context. The Pacific Legal Foundation has argued other wetlands cases before the U.S. Supreme Court. In the 2006 Rapanos v. U.S. case, the foundation represented a Michigan developer who filled in wetlands to build a shopping mall. The foundation’s attorneys argued that the Clean Water Act doesn’t give the EPA jurisdiction over all wetlands, and that the agency had overstepped its bounds. The Supreme Court responded in a split decision. Although the Sackett case addresses different legal issues, Pacific Legal Foundation attorneys see the two cases as related. In the Sackett case, Hopper said the Pacific Legal Foundation will argue that the EPA can’t impose “ruinous penalties” on an individual without providing a hearing and proof of violation. The conservative wing of the court is likely to be sympathetic to individual property owners “who think they are being strong-armed into an expensive permit process,” said Doremus, the law professor. In the Rapanos case, four members of the court “went on at some length about how unfair they think the wetlands provisions are and how widely they apply,” she said. In court documents, however, EPA attorneys noted that they can’t collect fines under the Clean Water Act until the agency has gone to court and proved that that defendant violated provisions of the act. The process gives landowners “a full opportunity” to argue that the EPA’s enforcement action was invalid, according to the EPA. So the defendant’s due process rights aren’t violated, agency attorneys said. The 9th Circuit Court of Appeals in San Francisco concurred, and at least three other circuit courts have reached similar conclusions about the Clean Water Act, Doremus said. “The fact that the Supreme Court decided to take this case suggests that at least four members of the court think that the circuit courts are getting it wrong,” she said. Doremus said that Clean Water Act penalties aren’t as “ruinous” as opponents describe. The court determines the fines based on how flagrant the violation is. The fines are typically much less than the $32,500 daily maximum, except in rare cases where the violation results in serious threats to human health, she said. As agencies, Doremus said the EPA and the Army Corps of Engineers are “quite sensitive” to wetlands politics. “They’ve tried to make it quite easy to find out if you’re subject to the Clean Water Act,” she said. The Sacketts, for instance, could have called the nearest office of the Army Corps of Engineers and asked for a binding determination on whether their property contained wetlands, Doremus said. But there’s some risk involved. “You’re in great shape if they say ‘No.’ If they say, ‘Yes, it is,’ and you fill it without a permit, the court is going to look at that,” she said. 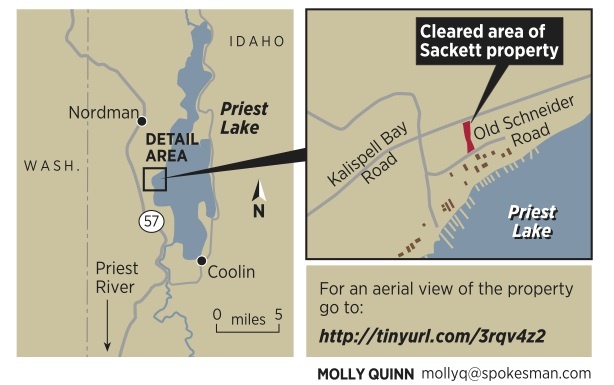 Even if the Sacketts win at the Supreme Court, it’s still possible that the couple’s Priest Lake lot could be declared a wetland at a later court hearing. But Mike Sackett thinks that’s an unlikely scenario. “The facts in this case will win,” he said. “Eventually, the right thing will happen – there will be a house here,” Chantell Sackett said. Despite their dispute with the EPA over wetlands, the Sacketts said they support environmental regulations that protect the lake they cherish.